Asian markets followed Wall Street higher Tuesday as investors watched for Brexit developments and corporate earnings. Benchmarks in Shanghai, Hong Kong and Seoul gained, while Tokyo and Sydney were little-changed. Southeast Asian markets also gained. On Wall Street, the benchmark Standard & Poor’s 500 index eked out a 0.1% gain to extend its winning to streak to eight days, its longest in 18 months. The Dow Jones Industrial Average ended lower due to another big loss for Boeing Co.
Investors looked ahead to developments in Britain’s contentious move toward leaving the European Union, a mid-week meeting by the European Central Bank and the release of minutes from the latest U.S. Federal Reserve meeting. British Prime Minister Theresa May plans to meet European leaders ahead of a Friday deadline for Britain to leave the European Union. British legislators have yet to agree to terms for the divorce from the trade bloc. Economists worry about the drag on the economy if the departure happens without that. “Moderate gains” are likely in Asian markets despite a lack of strong leads, helped by “benign updates from the event risks into the end of the week,” said Jingyi Pan of IG in a report. The Shanghai Composite Index rose 0.1% to 3,249.20 while Hong Kong’s Hang Seng gained 0.3% to 30,169.32. 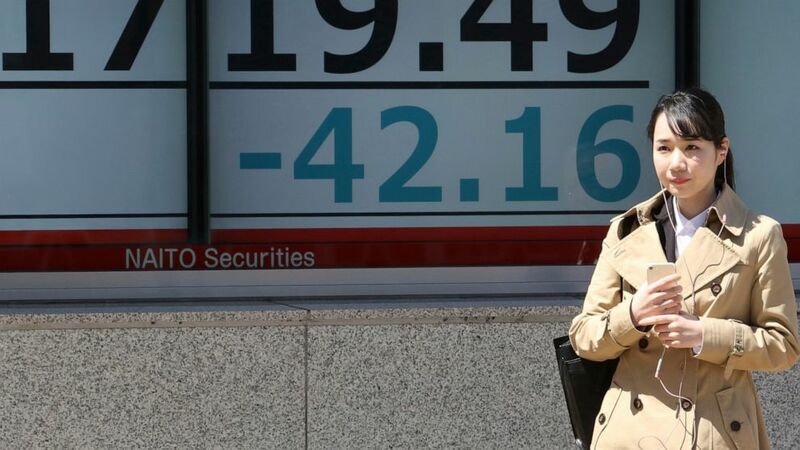 Seoul’s Kospi added 0.4% to 2,219.63 and India’s Sensex advanced 0.2% to 38,761.45. Tokyo’s Nikkei 225 was off 19 points at 21,780.23 and Sydney’s S&P-ASX 200 shed 8 points to 6,212.80. Southeast Asian markets and Taiwan advanced while New Zealand declined. On Wall Street, the S&P rose to 2,895.77. It climbed to within 1.2% of its record in September. The Dow slipped 0.3% to 26,341.02, and the Nasdaq gained 0.2% to 7,953.88. Boeing slumped 4.4% after saying Friday that it will cut production of its 737 Max plane. Regulators around the world grounded that model after it was involved in two fatal crashes. EARNINGS SEASON: The latest quarterly earnings season is due to start with JPMorgan Chase and other big banks. Analysts are forecasting the first drop in S&P 500 profits in years. They expect corporate profit growth to resume after the weak first quarter. CHINA-US TRADE: China’s official news agency said talks in Washington last week “achieved new progress” but did not say when further discussions will happen. Beijing and Washington are trying to end a tariff war over Beijing’s technology ambitions that has shaken financial markets and darkened the world economic outlook. ENERGY: Benchmark U.S. crude gained 13 cents to $64.53 per barrel in electronic trading on the New York Mercantile Exchange. The contract surged $1.32 on Monday to $64.40. Brent crude, used to price international oils, added 13 cents to $64.53 per barrel in London. It rose 76 cents the previous session to $71.10. CURRENCY: The dollar declined to 111.35 yen from Monday’s 111.47 yen. The euro edged up to $1.1267 from $1.1264.